Los Lunas, New Mexico - Welcome! Welcome!! This site is devoted to giving a brief, virtual tour of Los Lunas, New Mexico both photographically and with a few words. Of course it wouldn't be complete if we left out our neighboring towns in Valencia County. Also included is Belén, Los Chaves, Peralta, Bosque Farms, Tome, and Isleta. We feature about 15 pages of photos and text about the Los Lunas area. Which right before I lost count comprised over 60 photographs. Nearly all taken just recently. We've included contact information for the Los Lunas Chamber of Commerce. As well as for Belén, and a couple of other places that might be of interest. From personal experience, we've made a few suggestions of where you can find a good meal in the Los Lunas area, if you're planning a trip to the area. You will find some interesting links here too. On subjects specifically related to Los Lunas, historically, culturally, or things to see and do recreationally when your travels bring you to the Land of Enchantment. 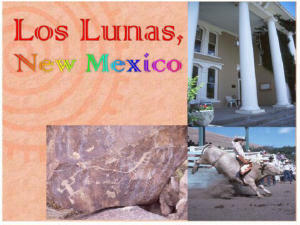 Again, welcome to our site about Los Lunas, New Mexico. All of our Los Lunas pages include the Zia symbol (left). Clicking on the Zia will always take you back to this page. Otherwise look for the words right of or below the Zia, that will take you to the next page in the series. Click here to Start the Tour of Los Lunas. Go to Bill & Kathy's Homepage. A graphic monitor setting of 600 x 800 or greater resolution. Internet Explorer v4.0 or Netscape v4.5 or later. Los Lunas, New Mexico - information about Los Lunas, New Mexico, Belen, Isleta, Bosque Farms, Peralta, Los Chaves, Socorro.